Chef Gordon Ramsay evidently knows what is good for him and stayed away from here during his recent visit to Vermont. All things considered, it’s probably a good thing, but we were still a little disappointed he didn’t show, especially after taunting mentioning him in a post. It was actually a crass and cynical move on my part, to take advantage of an internet search trend like that, but it worked. The post I link to above, and the post I link to from it (Eugene, Purly and Chef Gordon Ramsay), diverted quite a bit of search traffic (gordon ramsay in vermont) my way and the hits just keep coming —two of them today alone! I know some people are a bit taken aback when their innocent searches direct them to these pages but, unlike some practitioners of tenkara, at least a few foodies displayed a sense of humor upon their arrival. Some of them even became new subscribers to this blog. One in particular stands out, for a couple of reasons, and that is John-Bryan Hopkins, who has created the blog Foodimentary — A Food Lover’s Notebook. Because of Mr. Hopkins, I know that yesterday was National P B and J Day. I celebrated National Peppermint Patties Day the day before, and National Have a Brownie Day the day before that, thanks to him. As long as he stays away from organ meats, lima beans and beet juice, I think me and John-Bryan Hopkins can have a groovy thing going on. But it is more than his pimping of sweet treats that makes me happy to make his acquaintance; John-Bryan Hopkins not only has a hyphenated first name, he also sports an ascot, making him the third person I know to do so. Before my outdoorsy-type friends chime in with their feelings regarding neckwear, and before my new foodie friends figure out what really goes on around here, I thought it would be nice to spend a little time standing together on common ground, celebrating both food and the great outdoors. There’s nothing quite like a streamside breakfast to get a guy’s day off to a great start. Looking at the way old Milt there is holding that frying pan, I wonder if Wally isn’t retrieving a pancake. Of course, some guys just fired up the old Sportsman’s Stove and cooked steaks in the boat. “Safety First,” I always say! Coleman stoves were there, too, to help cook up a mess of trout, right where you caught ’em. But even way back then, not everyone could catch fish. 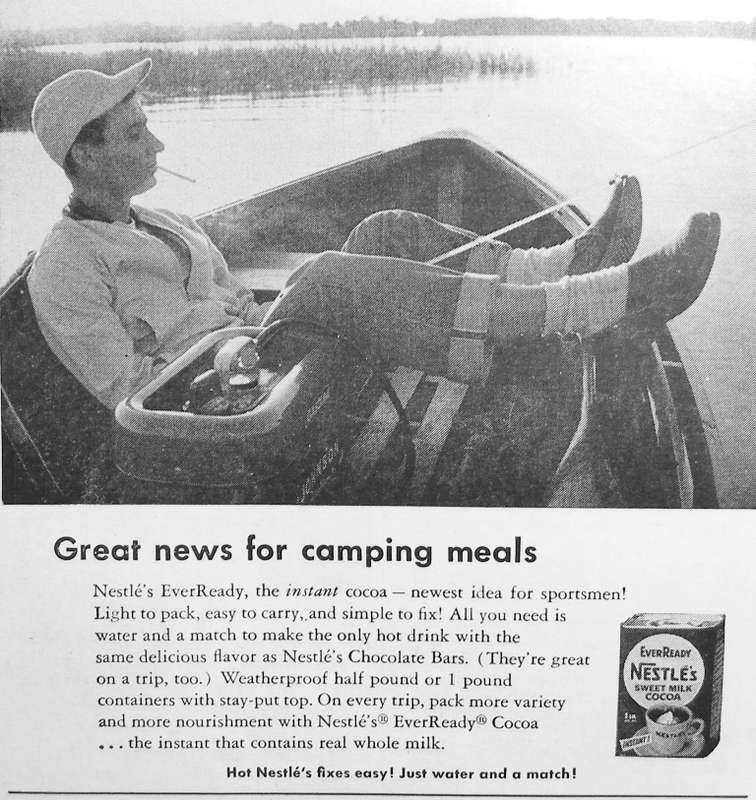 Alternatives to freshly caught trout and other kill-your-own fare have always been around — John Muir is said to have travelled with a bag of dried bread, tossing it downhill ahead of himself or banging it on trees to break off chunks he could soak in his tea — and in the 1950s, now familiar items like freeze-dried foods began to appear. 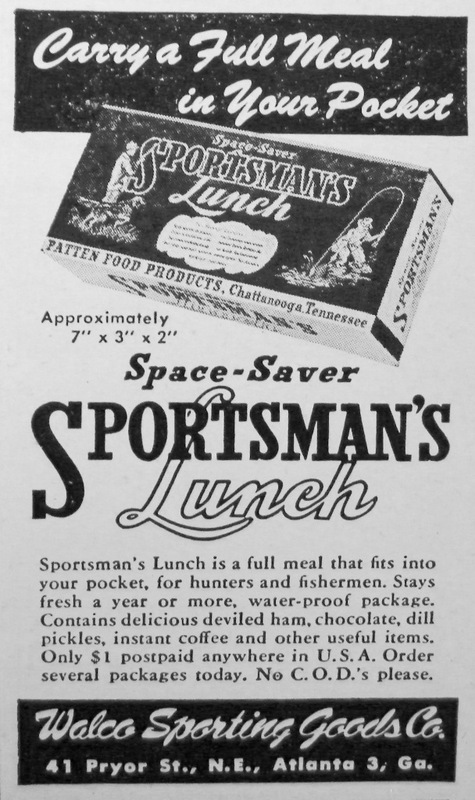 Not exactly freeze-dried, but no less well-preserved, the Sportsman’s Lunch featured deviled ham, dill pickles, instant coffee, and “other useful items”. SPAM has been a versatile, dependable favorite of outdoors folk for years. 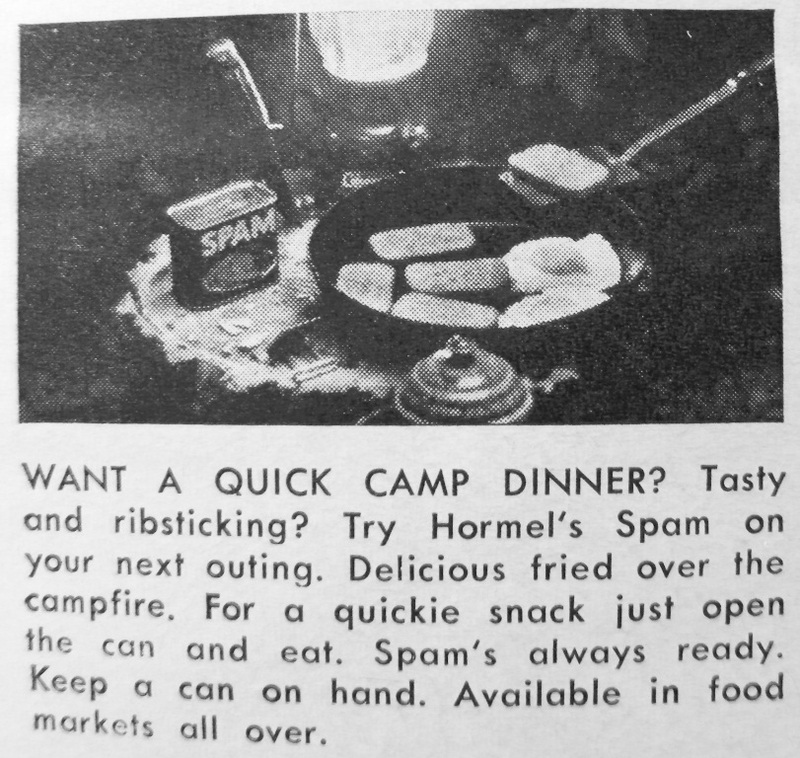 Some like their SPAM fried, with eggs, but the folks at Hormel suggest eating it straight from the can. Perhaps with a spoon? No need for a trip to some fancy camping store or waiting for the mail, either; SPAM is still available in food markets all over. Some folks prefer a little refinement when it comes to camp food. 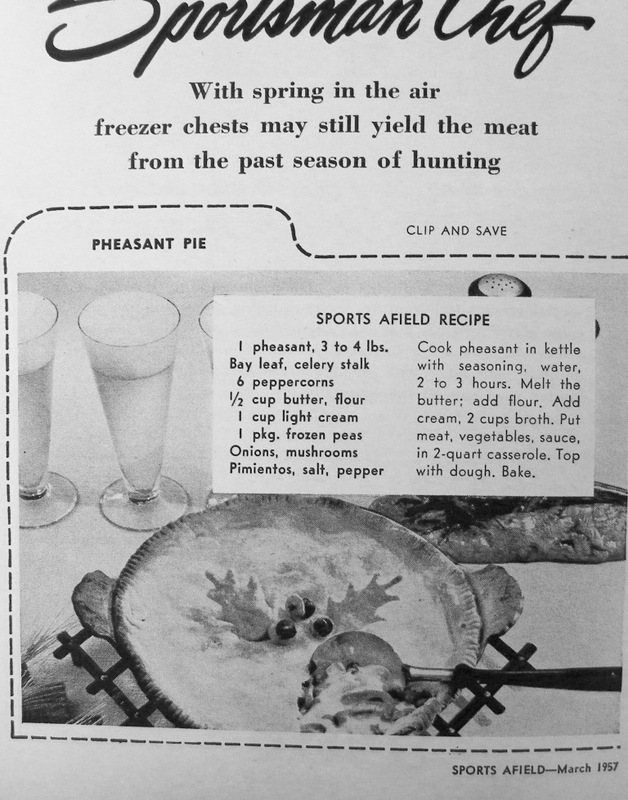 Recipes, like this one from a 1957 issue of Sports Afield, helped the successful hunter share the bounty with his friends while also disposing of old, freezer-burned game. Note the detailed cooking instructions. I myself have been the recipient of such bounty. Evidently convinced I had never tasted pheasant before, one fellow I know foisted upon me some pheasant soup he had made, assuring me I was in for a real treat. If a pheasant ran past a puddle, that puddle would need to be diluted to resemble the broth I found in my bowl. Small, fleshy flakes, swirled in the murk, tiny shreds I barely felt between my teeth, and the four exotic, miniature peppercorns at the bottom turned out to be pellets of bird shot, which I most certainly and in no uncertain terms felt between my teeth. I am always grateful when my friends take it upon themselves to expand my horizons and learn me to appreciate the finer things in life like that. It’s not always easy, blending the hearty outdoor life with sophisticated fineries, but writer Corey Ford was able to do just that, cooking bacon with his dog for a Coleman stove endorsement one day and maybe sitting in for a game of cribbage with the members of the infamous Algonquin Round Table the next. Corey Ford lived for a time in Hanover, New Hampshire, where he was an advisor to the Dartmouth chapter of Delta Kappa Epsilon and several student publications. He also organized the Dartmouth Rugby Club. When he died in 1969 he left the bulk of his estate to the Rugby Club, and the Corey Ford Rugby Clubhouse was eventually dedicated in 2005. If he cooked bacon half as well as he wrote, meal time with Corey Ford would have been memorable. He’d probably roll over in his grave, though, if he saw the prices his books bring these days. I’m sure there’s nothing quite like eating bacon right from the can, but you’ll notice other concerns creeping into our consciousness in this ad from 1957. 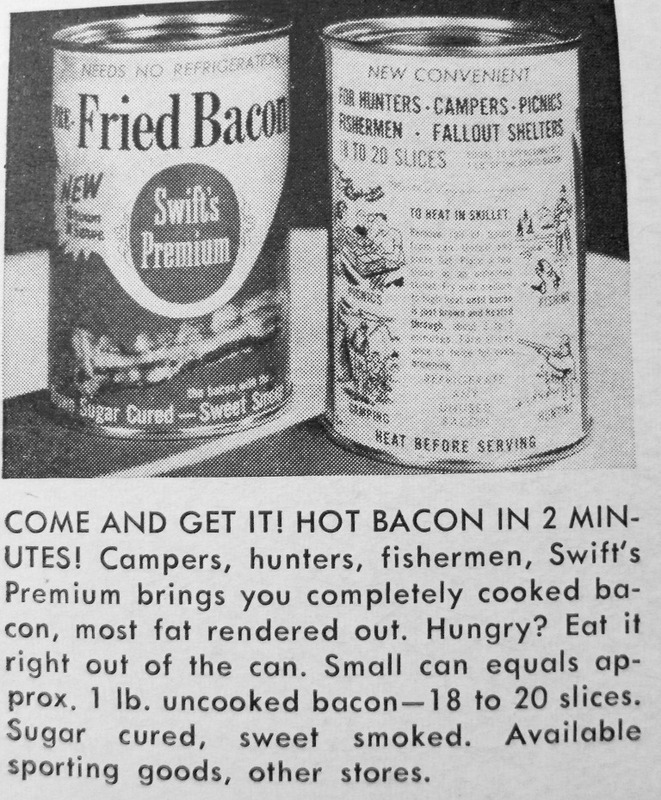 Not only were we worried about what foods could be safely brought along on camping trips, there was also the constant fear of nuclear annihilation but, thanks to Swift’s, those long weeks in a fallout shelter would be easier to tolerate with a daily dose of bacon-y goodness. Before Nestlé got into the business of bottling and selling water, they were known for their chocolate products and what a great day it was that they introduced their instant cocoa mix, containing real whole milk. How nice to get away from it all, to forget about the looming Red Menace for a while, and enjoy a morning on the lake with a nice cup of cocoa and a smoke. Just water and a match were all you needed, but I’d be careful if I were you, kicking back next to a gas can like that. 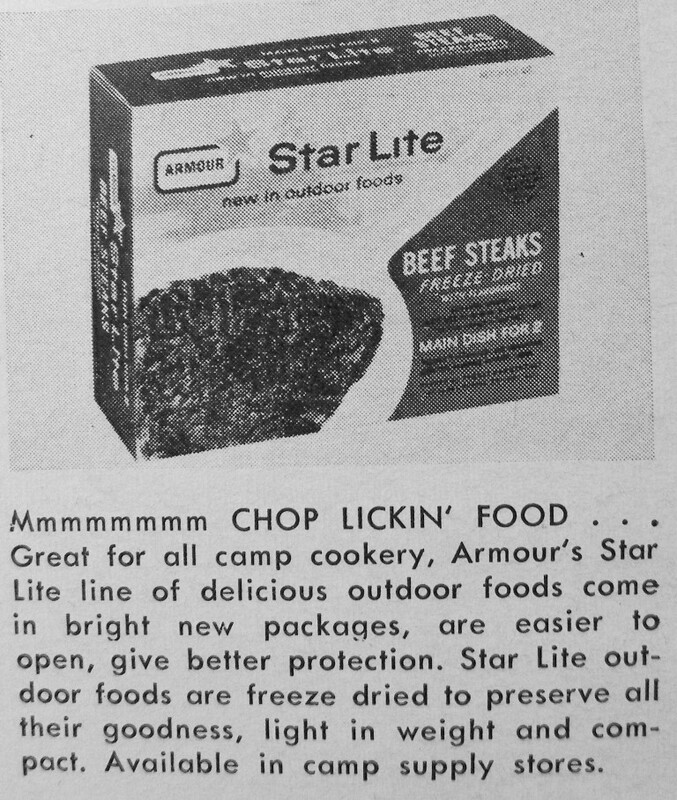 The good folks at Heinz understood the allure of camp food. 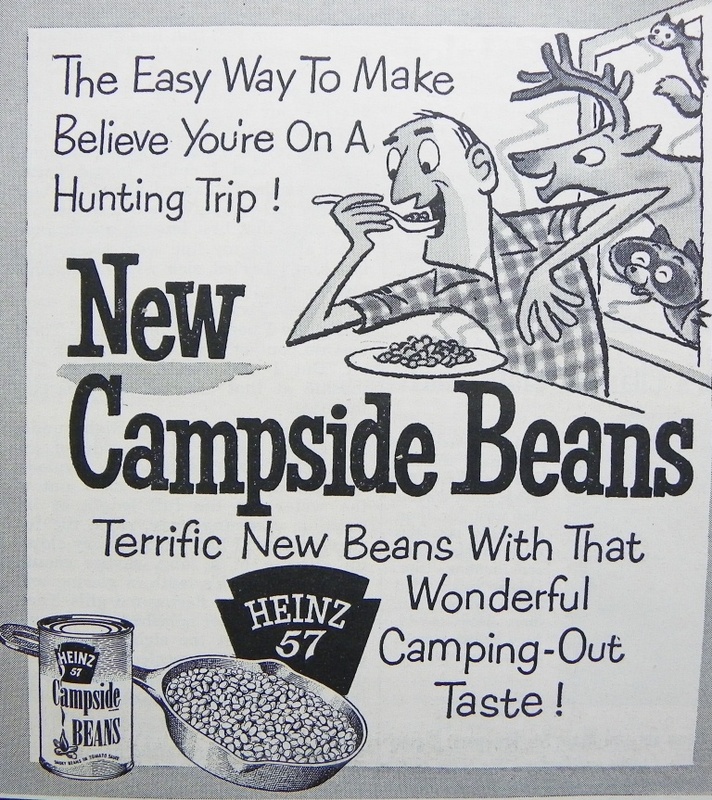 They also understood that some among us might not want all the trouble of actually going into the woods, just for a taste of the outdoors, so they introduced Campside Beans, with “that wonderful camping-out taste”, presumably flavored with grit and ashes. Notice how happy the woodland creatures are that this guy has stayed inside to eat beans rather than tromping through the woods shooting stuff. We’ve come a long way, when it comes to the food we enjoy outdoors. Not many people cook their fish streamside any more, while advances in camp stoves and freeze-drying have allowed folks in the most remote places to enjoy tasty dishes our forefathers would never have dreamed of. Improvements over the years to the camps here at Fish in a Barrel Pond have included the installation of electric ranges and even microwaves, so meals around here can be as simple or as elaborate as any outdoors person could desire (dinner is generally served after fishing the evening rise, some time around 10:30). I began taking reservations for the upcoming season this weekend. Among the myriad of thoughts that swirled through my brain as I did so (see my Diary of a Trout Bum), I thought of the meals I mooch hospitality and food I accept in the name of outdoorsy fellowship. Thin broth with shreds of freezer burned fowl, pawned off as pheasant soup; maybe a nice paella or a mess of crawfish; canned chili “doctored” dangerously beyond recognition; or even a nice, grilled steak — I never know what’s going to hit the table. The spirit in which it is served, and the company among whom it is shared, might just be the most important aspects of a memorable meal at camp, which could explain why one of my fondest memories is of a warm mid-summer night spent at a table, discussing fish over bourbon and Doritos™, using our ascots as napkins. Now, get out there and eat! Granny Smith and sharp cheddar! 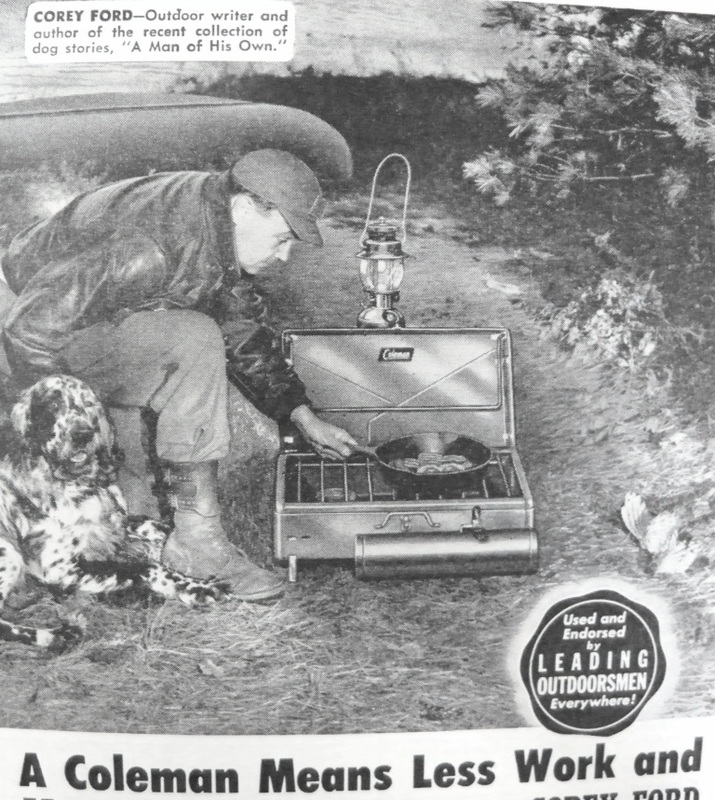 ’57 was a good year for outdoor vittles. Especially liked those New Campside Beans (lazer beans!) The commies didn’t dare come over. The thought of our shores, lined with outdoorsmen armed with cans of beans is kind of funny. So is remembering Blazing Saddles. That “twice-cooked” pheasant recipe sounds almost tractable. It’s the flexibility that appeals to me most. If I have three hours to boil, I’ll do it. But if I only have two, I can be pretty confident that the bird will still be done. Provided, of course, that after that I bake it. I remember a few pheasants that I boiled for only 90 minutes, followed by deep-frying and then a few minutes in the microwave. They were well-done, you could say, but this new recipe is far less complicated. Not only does the pheasant get cooked real good, somehow, dough for a crust magically appears. “Bake” is a lot like the directions in my planned cook book for bachelors — “cook until done” — but maybe I’m being too specific? Don, I’m glad you enjoyed it. I have a feeling you and I probably agree that bacon and scotch will do just fine. An eipicurian delicacy, burbon & Dorirtios-another good ‘un Quill. I can recall an AK trip where we were catching silver salmon from an aluminum skiff and were one shy of our limit when I caught one that was a little undersized. Our guide didn’r want to be embarssed by brining in an undersized fish so it ws dispatched and he hauled out his habatchi. Within 15-20 minites we had some of the most delicious silver salmon I’ve ever tasted. Most everything tastes better fresh, doesn’t it? I’m looking forward to bourbon and Doritos with you this spring and hearing about your southern hemisphere adventures.